Welcome to Open Door’s 2015 Annual Report. Thanks to valued support from friends in the community, Open Door continues to provide activities for adults with physical & sensory disabilities while also offering support to carers and families on a regular basis. Throughout this report you can see how your donations and support have impacted positively on members lives. Please continue to remember Open Door and the valuable work that takes place in the Centre to ensure that many more people will be facilitated and assisted in future years. We entered into 2015 with strategies to provide the best care for our members while dealing with a downturn in funds due to negative publicity in the Charity sector. We continually endeavour to counteract any public negativity through being open and transparent. Open Door is signed up to The Governance Code, is a member of Fundraising Ireland and of The Wheel and is registered with the Charity Regulatory Authority (Charity Registered Number: 20014124). The constant increase in applications for membership is a strong indicator that there is a continued need for our services in the community. Open Door's catchment area is South County Dublin and North Wicklow. Our Care Manager, Rudy Montejo, works hard to accommodate as many members as possible with the resources available. Open Door is fortunate to have dedicated team of staff and volunteers who are always on hand to assist members during the day. Many friendships are formed between members facing similar life challenges and this social aspect of Open Door is just as important as the activities themselves. We remember with fondness, each of our past members, they will never be forgotten. The many activities including Art, Ceramics, Woodwork, Music, Computers and Physiotherapy are enjoyable, therapeutic and rewarding. 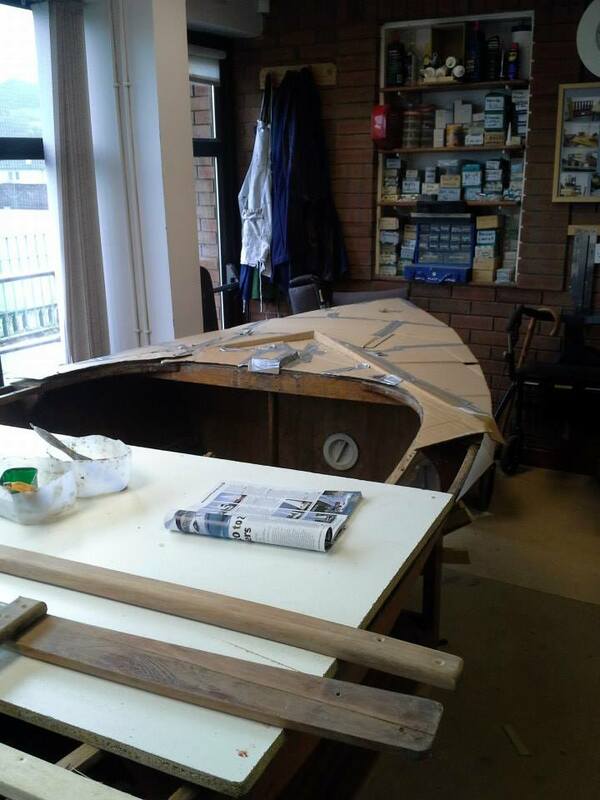 The Woodwork team has been involved in a boat restoration project this year and hope to complete it in mid-2016. Our 'Making Sense with Cents' campaign continues. Please consider placing one of our Counter Top collection boxes in your shop, home or place of work. Many thanks to those who have already kindly placed these boxes in their shops and businesses and helped raise funds for the Centre. To become involved click here. In order to continue to provide activities including physiotherapy, art, music, woodwork and ceramics, we are constantly reaching out for help with our fundraising events. The Sugarloaf Lions Club has supported Open Door for the past 8 years by running an annual Table Quiz. This year's quiz was held in Greystones Rugby Club and there was a great turnout. Congratulations to Bray Lions Club on coming 1st. A total of €1,500 was donated to Open Door as a result of this fun event. As part of our 'Open your door for Open Door' fundraising inititiative, Virginia Ryan held a coffee morning in her home on February 4th. Funds were raised through donations and a raffle. Perhaps you would consider hosting a coffee morning in aid of Open Door? We can supply t-shirts and literature to support your event. Contact 01 2867123 for further details. Sylvia Scanlon hosted a Family Fun Day in March in the Mill Room, Kilcoole. This event was in aid of Newcastle Hospital, The Samaritans and Open Door. Sylvia presented Open Door with €450 towards activities for members. Canterbury High School Musicians performed at a concert in Open Door on 28th March. This was a lovely evening where friends and supporters of Open Door enjoyed music and song. As part of their UCD Service Learning project, a group of four UCD students, Jamie Fernandez Corrigan, Orlaith Keane, Claire Kavanagh and Julia Perez, worked with Open Door on a project to raise the profile of the Centre and to help bring in funds towards the many activities available to adults with physical and sensory disabilities. Many thanks to this hard working and innovative group of students for all their help. Susie McParland and Alannah Crowley, TY students at St Gerard's, hosted a coffee morning and raffle in Greystones Tennis Club. The girls had completed their work experience in Open Door and were so impressed with the Centre that they decided to run a fundraising event. During the months of May and June, Bray Recycling Centre and Open Door ran the 3rd annual 'Trash to Treasure' campaign. The value of all scrap metal and clothing collected in the Recycling Centre during this time was donated to Open Door. Many thanks to Bray Recycling Centre, Leon Recycling and Best Irish Used Clothing for their support. Not only do we need to raise funds for our programme of activities but but we must also find money to replace equipment in the Centre. We recently took delivery of a new physiotherapy aids to compliment our existing range of Physiotherapy equipment. Lukasz Oleksiewicz, Physiotherapist, sees the positive impact on each of our members. The annual Mid-Summer Lunch is a very popular day with our friends and supporters. The 2015 event took place at Open Door on Saturday 13th June. The day was a success largely due to the work of Chef John Tutty and Christopher Daly who kindly donate their time and expertise each year to produce a fantastic meal for 110 people. Musician Brian Mitchell entertained the guests with his guitar. Our new PA system, thanks to a Wicklow County Council Community Grant, was put to good use on the day. Ronald Carroll, Chairperson of Open Door Trust, thanked everyone for their support. The 2016 Open Door Mid-Summer lunch takes place on Saturday 11th June. Female friends & supporters put their best foot forward in the Vhi Women's Mini Marathon on Monday 1st June in support of Open Door. Please consider joining us in 2016, on June 6th, to help adults with physical & sensory disabilities. 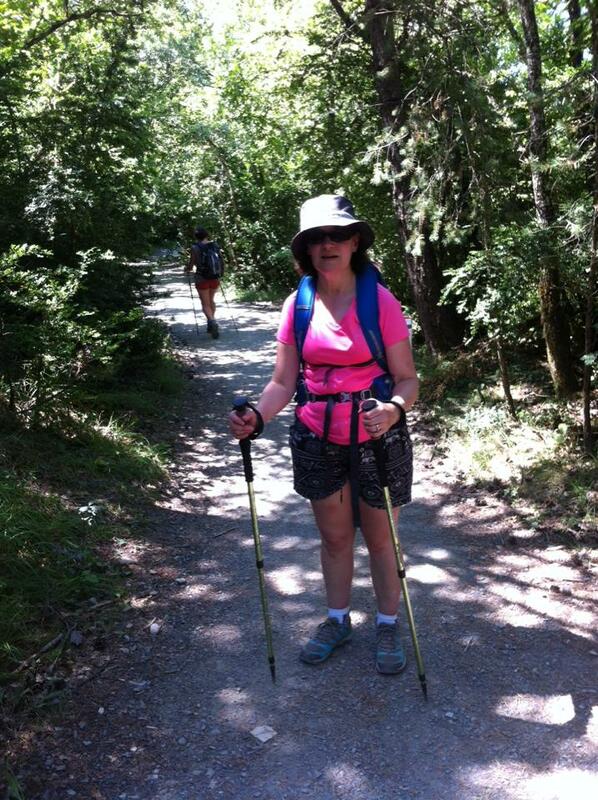 Contact Suzanne on 01 286 7123 / 087 625 0823 or CLICK HERE to secure your sponsorship pack. Ronan Corrigan of Global Medics sponsored 1,500 Open Door badges to be used during bag packs and collections. Mission Valley Chorus from San Francisco performed in St Patrick's Church, Greystones on July 21st. The evening was very well attended by members, staff, trustees, volunteers and supporters of Open Door. Many thanks to Patrick Murphy for his organisation of this and many other concerts for Open Door. Tesco, Greystones kindly allocated a bag pack slot on 24th and 25th of July. We would like to thank our many volunteers for their help with this annual event. The annual Open Door Members outings took place in July. Members visited Kilkenny Castle and then enjoyed some shopping followed by a lunch in the town. We were delighted to receive a HSE National Lottery grant to replace our old analogue telephone system with a new digital system. Many thanks to volunteers, staff and trustees for all their help at the bucket collection during the Bray Air Show on 19th July. The Hospital Saturday Fund kindly awarded a grant towards Physiotherapy at Open Door which is much appreciated. 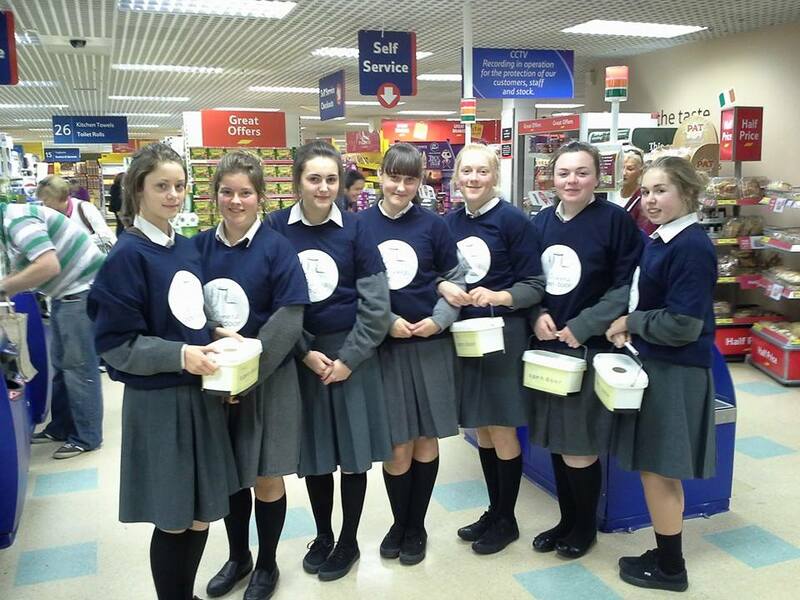 The annual Tesco Bray/ Loreto Bray Bag pack took place on 11th September. We would like to thank everyone who donated to and helped with this annual bag pack. This annual bag pack helps to fund the many activities available to adults with physical and sensory disabilities. Our Woodwork team are enjoying their ‘Boat Project’ - a restoration project that involves members, staff and volunteers. 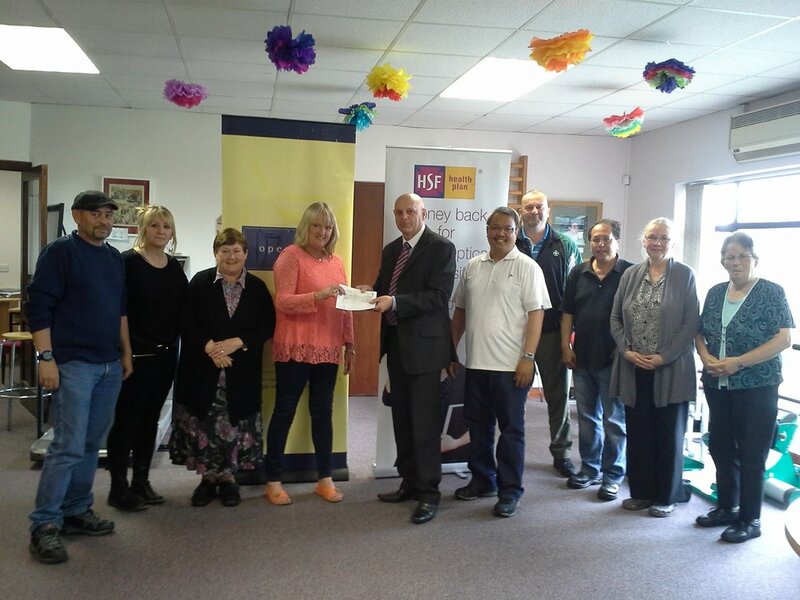 We were delighted to receive a grant from Electric Aid to purchase new touch screen computers for the Centre. This new technology makes it easier for our members to access information and also to communicate with family and friends around the world. Congratulations and many thanks to Peter Doran on completing the Dublin Marathon and on raising funds for Open Door. An exhibition of Art, Ceramics and Woodwork took place in the Centre on Decemver 4th and 5th. Artist, Michael Gemmell opened the exibition and gave an art demonstartion on the Friday night. It was wonderful to see the work of members of Open Door on display throughout the building. Funds were raised through the sale of artwork and also from a raffle for one of Michael Gemmell's oils on canvas entitled 'Winter on the Burren'. Many thanks to Michael Gemmell, Jenny Dann and Deirdre Hackett-Mooney for all their hard work ensuring the event was a success. Martina Crinnion from Donelli's of Wicklow hosted a Festive Food Evening on December 15th. This was a most enjoyable night where guests watched food and drink preparations and enjoyed samples of each of the tasty treats. Martina also donated a selection of Christmas gifts towards the raffle. 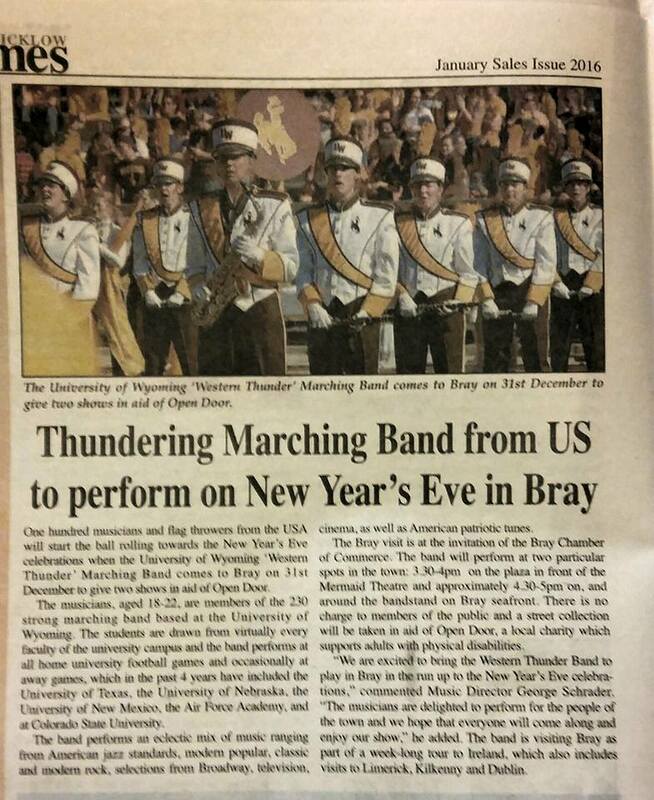 On December 31st, the Western Thunder Marching Band from Wyoming, USA, performed in Bray as a fundraiser for Open Door. Despite the inclement weather, the people of Bray donated generously and helped to raise funds for the Centre.